Sometimes all you want is one lens that can do it all. Olympus is aiming to make you happy with its release of the M.Zuiko Digital ED 12-200mm f/3.5-6.3 Lens for Micro Four Thirds. 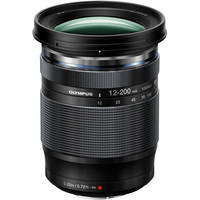 Being equivalent to a 24-400mm—Olympus's largest zoom range—this lens is truly an all-in-one. Capture landscapes, portraits, sports, wildlife, and practically anything else you can imagine with a quick twist of the zoom ring. It even stays relatively lightweight at just 1 lb, and compact at 3.05 x 3.93", thanks in part to a conservative f/3.5-6.3 maximum aperture range. A quite complete feature set expands the versatility of this lens, including the ability to focus as close as 8.7" and achieve a maximum magnification of 0.44x for close-up photography. High-speed autofocus ensures you won't miss a shot in stills or video, while a ZERO coating minimizes flare and ghosting. Also, it is dustproof and splash proof, so you need not worry if you are caught in inclement weather. How do you feel about Olympus's now most accomplished all-in-one lens and its 16.6x zoom? Are you going to pick one up? Please leave a comment below with your thoughts. The Olympus 12-100 mm f/4 Pro lens is very sharp throughout the reach of the lens and at all apertures (as are other Oly Pro lenses). It's probably the sharpest walk around lens available (inc Canon, Sony, Nikon, Tamron, I've used them all). That being said, the 12-200 mm is not an Olympus Pro lens. It probably does not have as perfect an end-to-end sharpness as the 12-100 mm lens. It likely has some long-end softness, as do the other very long all-in-one lens in all brands. I hope to be surprised... I love the other compact and very sharp lenses from Olympus. I'm guessing that this will be another lens that will not allow focus stacking. One of Olympus' drawback compared to Lumix, were any of their lenses can be used. I have the two macro lenses that work, but wish I didn't have to purchase a pro zoom lens for focus stacking. I wish that at least they could do a firmware update on my 12 to 50 mm which I love. I contacted Olympus America with your inquiry. Olympus Technical Support states that the new Olympus M.Zuiko Digital ED 12-200mm f/3.5-6.3 Lens is not compatible with the in-camera Focus Stacking feature. They state that at this time, they have no knowledge if it will or if it is possible to change with a future firmware update. I have the 12-100 f/4 and have been amazed at its performance. If this new lens can come close, I'll probably get one, after reading a few reviews. I shoot a lot of field sports, and the frequent issue is how one needs a long lens for far action, and then a wide angle when the players get close. The Canon 28-300 is attempt to solve that problem. Lately, I've used two cameras, but the speedy transition can be problematic. Im not a lover of extending zoom lenses - the olympus 12-50 3.5-6.3 does not. Having said that this lens covers a great range of 24-400 in full frame terms, and may reduce the need to change lenses in the "field". Anything that reduces dust on the sensor is a good thing :) .